Halloween is on the horizon, and it's time to start decorating your home to create that playful ambiance that makes this holiday so much fun for kids. Since little ones are often spooked by Halloween decorations, we've rounded up ten crafts that will help tots get into the spirit of Halloween, without all the scary stuff. 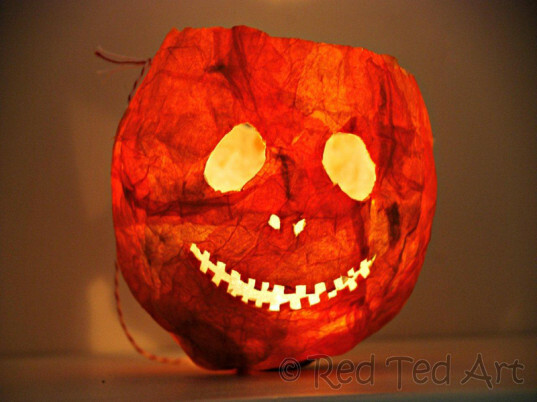 These quirky Halloween crafts provide a great opportunity for you to bond with your children, and they may all be made using eco-friendly and recycled materials -- many of which you probably already have on hand. Read on for 10 of our favorite eco-friendly crafts for green kids and get ready for some not-so-frightfully good fun! Have you found yourself with a large stack of pressed leaves from that family fall hike? If you are looking for a new and fun way to display them in your home, then this first project is for you. 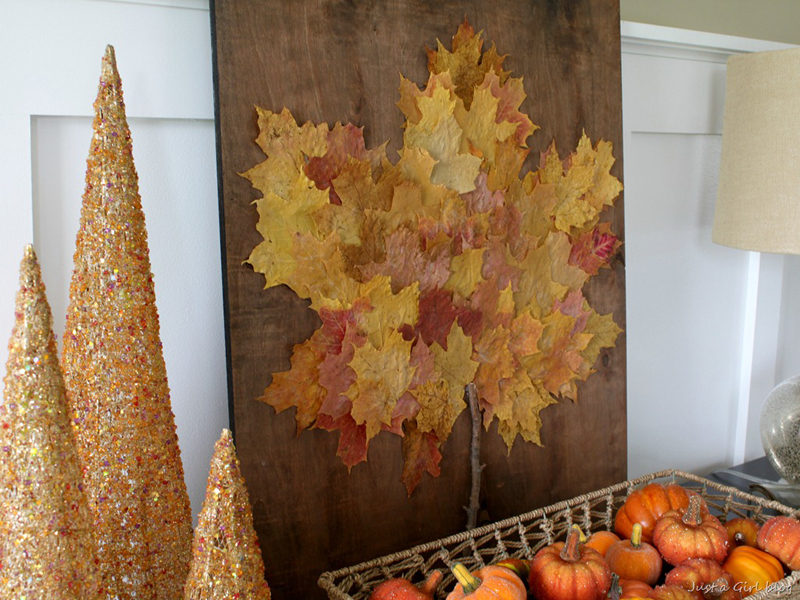 When you arrange them on a large piece of recycled wood into a much larger leaf – the impact is tremendous! 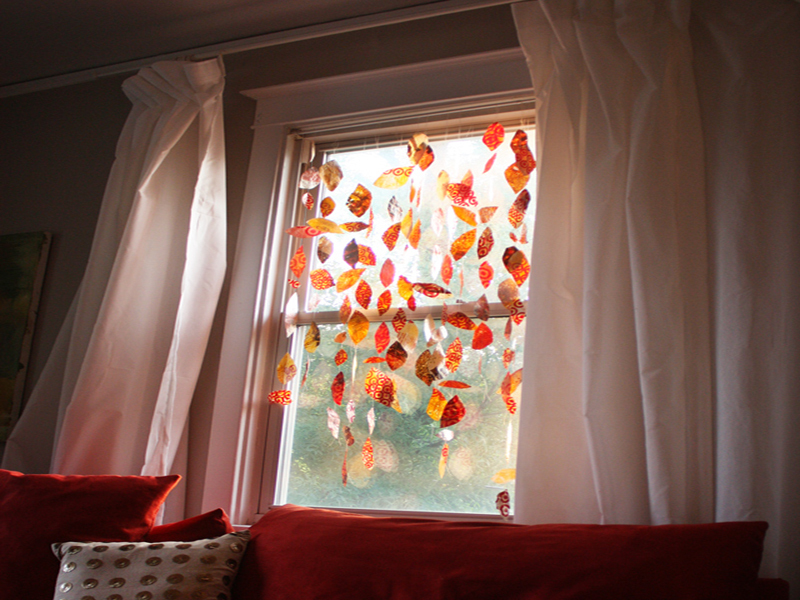 If you have a large stash of plastic bags stuffed in a cabinet, and you want to add a little autumn to your living room, this leaf garland will fit the bill. The kids can help by cutting out all of the leaf shapes and once the project is completed the entire family can enjoy this project all season long. 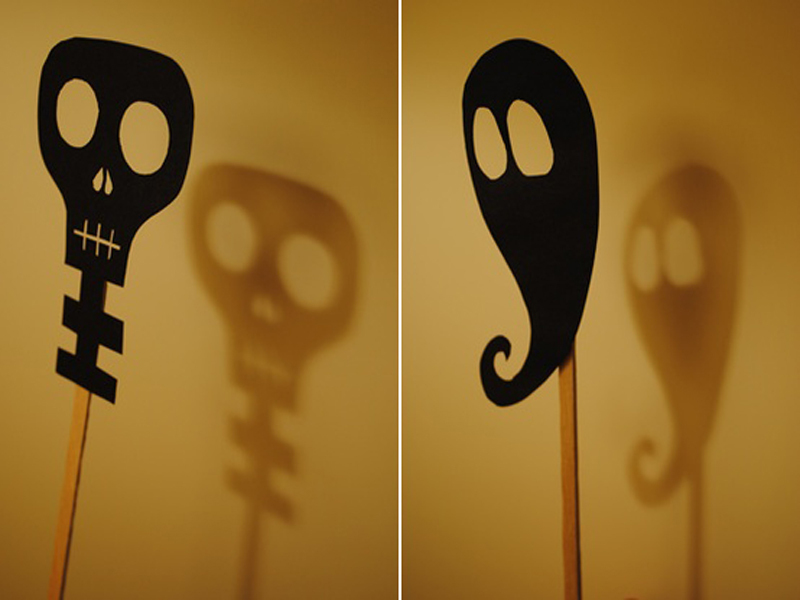 Why not have a shadow puppet show with the littles this Halloween? These shadow puppets will give your children hours of fun in the shadows. You can make these with all recycled materials too! Here is another great baby food jar project – this time, one for Halloween. These little luminaries are perfect for your little ones to customize any way that they choose. In fact, they can make a lot of different kinds to decorate your home this Halloween. If you have any paper plates from holiday and birthday parties and are looking for a fun craft for the kids – this is it! These paper plate spooks can be customized in any way your child can imagine and they are a great way to use up those leftover plates – giving you decorations that your children will enjoy seeing for years to come. Now, these are the types of recycled Halloween projects that your family will adore seeing in the Halloween box each year. 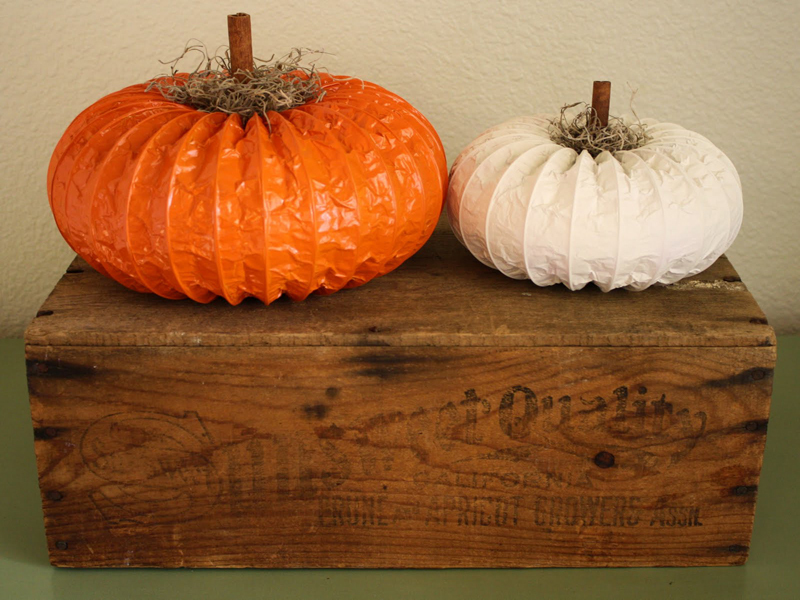 Reminiscent of many years past, these fun lanterns will be a great October project for the entire family. Head to the garage for this project and scour the shelves for a leftover dryer vent and spray paint. After an afternoon of crafting these adorable pumpkins, you will be left with a decoration that your family will enjoy every autumn. 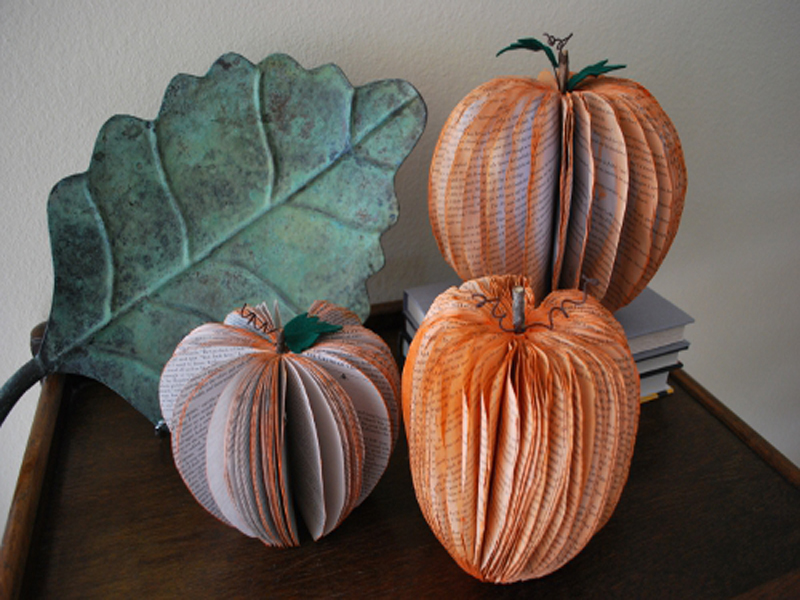 If you have a bunch of old books collecting dust in boxes in your garage, why not transform them into beautiful pumpkins that your family can enjoy all autumn? The great thing about pumpkin crafts is they can be enjoyed not only for Halloween but Thanksgiving too, giving you more bang for your crafting buck! 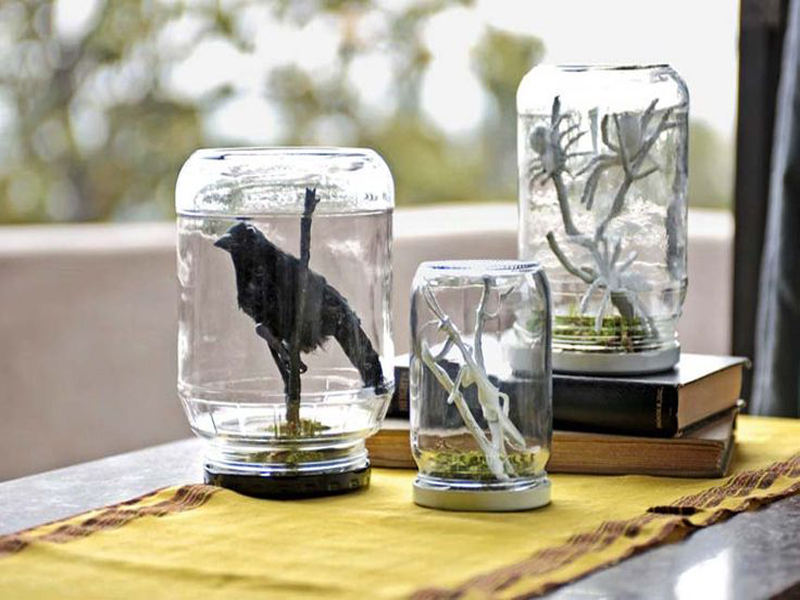 We are huge fans of terrariums and the spooky version is no different. These recycled bottles filled with creepy crawlies, birds, branches and moss will be the perfect decoration for your Halloween mantle. Or group a bunch of them on the dining room table for a centerpiece that will spook your Halloween guests. Children will love making these monsters from recycled tissue boxes. What’s not to love? Whether your child stuffs the monster with toys or Halloween goodies, it is a project that they will definitely enjoy. See our previous tutorial on how to make a monster box to house your Halloween candy handouts! I can't wait to try some of these crafts with my little guy after a nature walk to find supplies! Have to love fall! Have you found yourself with a large stack of pressed leaves from that family fall hike? If you are looking for a new and fun way to display them in your home, then this first project is for you. When you arrange them on a large piece of recycled wood into a much larger leaf - the impact is tremendous! 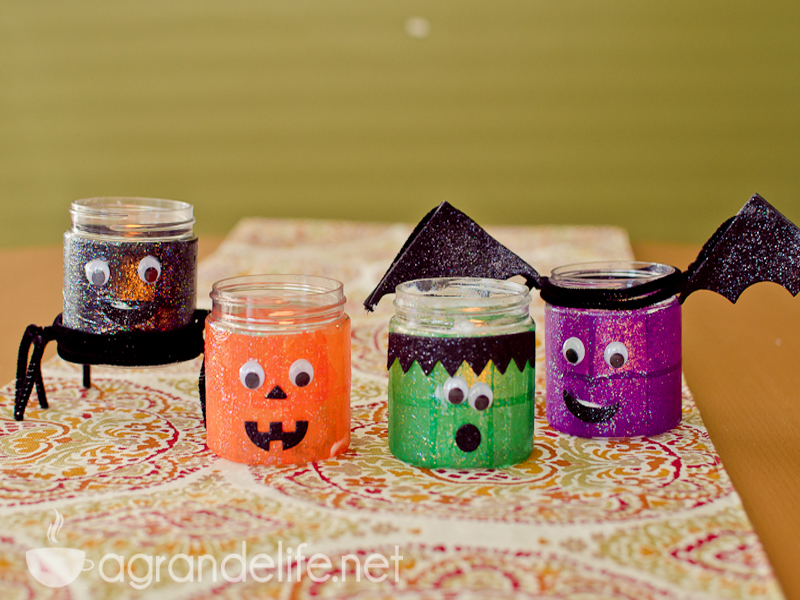 Here is another great baby food jar project - this time, one for Halloween. These little luminaries are perfect for your little ones to customize any way that they choose. In fact, they can make a lot of different kinds to decorate your home this Halloween. If you have any paper plates from holiday and birthday parties and are looking for a fun craft for the kids - this is it! 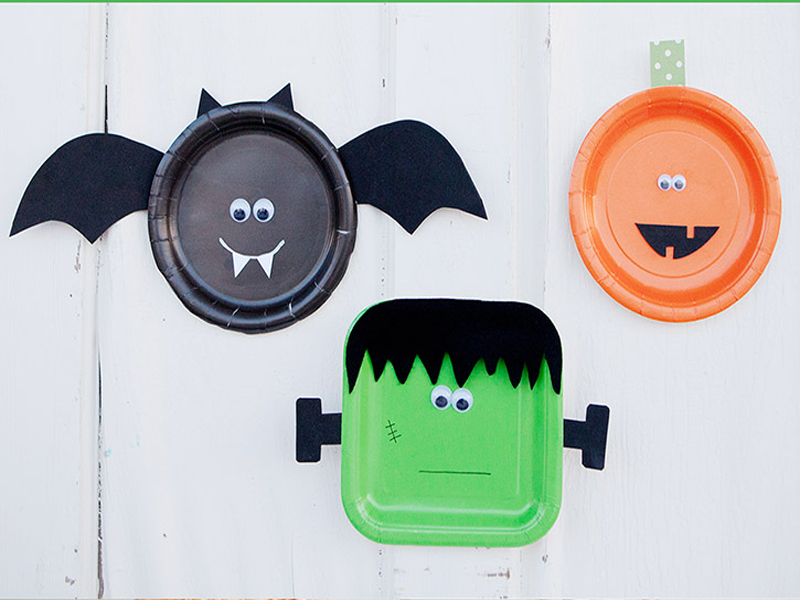 These paper plate spooks can be customized in any way your child can imagine and they are a great way to use up those leftover plates - giving you decorations that your children will enjoy seeing for years to come. 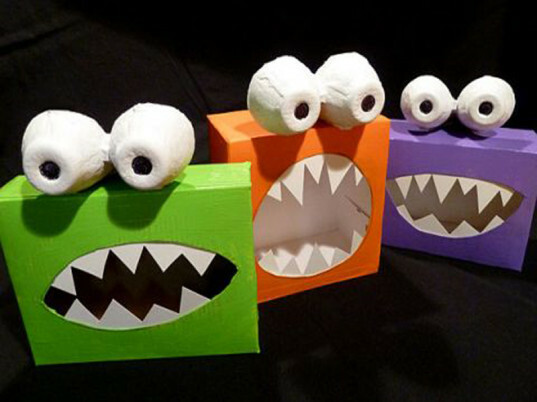 Children will love making these monsters from recycled tissue boxes. What's not to love? Whether your child stuffs the monster with toys or Halloween goodies, it is a project that they will definitely enjoy. See our previous tutorial on how to make a monster box to house your Halloween candy handouts!